Hi, I’m Ravichand. Welcome to Stock and Ladder, my home on the web devoted to the study of my life’s passion – Investing and Stock markets. 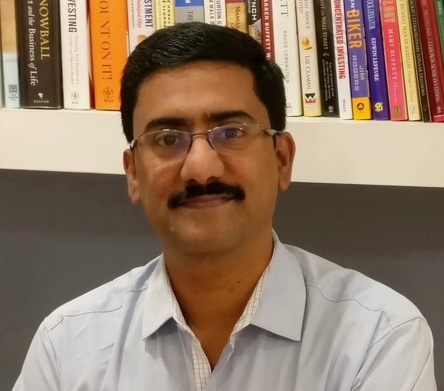 Post my MBA when I began my actual investing journey, I quickly understood the wisdom behind Warren Buffett’s wise words “I did be a bum on the street with a tin cup if the markets were always efficient”. It clearly dawned on me that the actual world of investing is quite different from the one I was expecting it to be (based on my MBA textbooks). In my quest to find some real-world answers on “What works in Investing?, I swapped the studying of academic textbooks with the reading of investment classics written by successful super investors. This helped me find my answers and the way forward. The smartest, the brightest and the most successful investors’ a.k.a. the “Superinvestors” have each spent a lifetime in investing, in reading and in thinking for gaining their investing wisdom on “what works in investing” and on “how to invest better”. Their long track record of investing out-performance is a clear validation that their strategies and ideas are markets proven actionable pieces of investing insights and not mere pieces of academic knowledge. 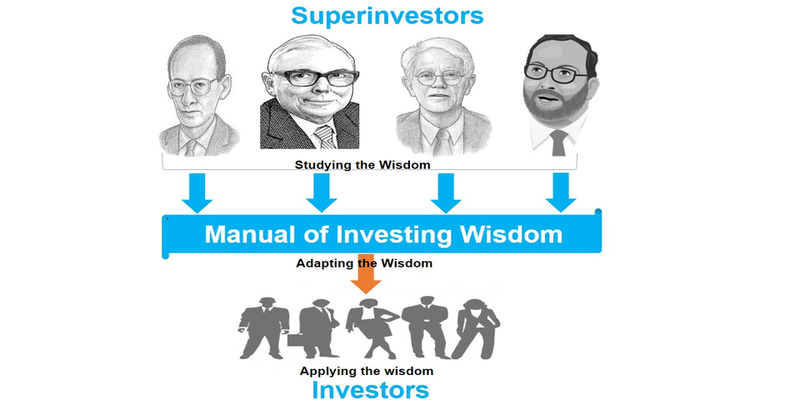 Logically then, the simple yet smart thing to do for normal investors like you and me is, to study the life lessons (investing wisdom) of these successful Superinvestors and apply their wisdom to our investing. Our life is too short for us to spend it on reinventing the “investing” wheel or in trying to learn to invest by committing all the mistakes oneself. Study from the Masters, Adapt from the Masters, Become the Master . Inspired by Leonardo Da Vinci’s golden words: “Simplicity is the ultimate sophistication”, you will find No Greek symbols, No financial jargons, and No complex mathematical computations being discussed in these pages. Instead what you will find here is the investing lessons, ideas and wisdom gleaned from studying the investing masterminds shared in the simple and plain language. I am also lucky to have the privilege to be able to pick the brains of some of the best investing minds . I share their learning/experience via the investing chat series. Occasionally I also write about my thoughts on specific stocks from the Indian markets. These are meant strictly to be used for educational purposes. If you are new to Stock and Ladder then a good place to start will be the Best Posts page where you will find some of our most read and popular articles. The complete set of articles published can be accessed here. Michelangelo, one of the greatest artist ever had this observation to make at a ripe old age of 87 years: “Ancora Imparo” (In Italian this loosely means “I am still learning”). Continuous learning is a must for success in any field including in the area investing. Books are of great help for continuous learning and if you need any inspiration to pick up the best books to read then do check out the Superinvestors bookshelf. I am assembling a collection of fine reading lists from some of the best investing minds and Superinvestors from across the world including the amazing guests I interview for my investing chat series. As I proceed on this journey of studying successful superinvestors and figuring out “How to invest better”, I love to have your thoughts, feedback, and good wishes. Let’s stay connected. To receive the latest posts delivered directly in your inbox for FREE, please provide your email address in the subscription box below. I am also active on Twitter and tweet @stocknladdr.